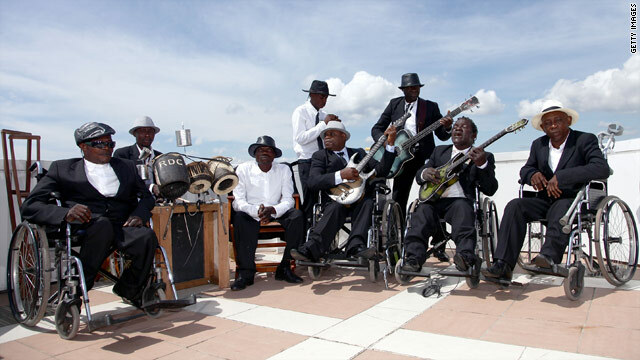 Cannes, France (CNN) -- A group of disabled Congolese musicians could soon become a global sensation after an acclaimed documentary about the group was shown at the Cannes Film Festival. The core members of Staff Benda Bilili are four musicians who suffered from polio as children. Three use wheelchairs, one is on crutches, and together they make heartfelt music that is winning fans far beyond their homeland. With their soulful harmonies and hypnotic Congolese rumba beat, their music has been likened to Buena Vista Social Club. And like the Cuban group, Staff Benda Bilili is crossing over into the international mainstream. They are about to embark on a grueling tour that will see them perform at venues and festivals all over Europe this summer, before touring Japan. But their new-found fame is a far cry from years spent making a living on the streets of Kinshasa, the capital of the Democratic Republic of Congo. It was in Kinshasa in 2004 that they met French filmmakers Florent de La Tullaye and Renaud Barret, who were in the city documenting its music scene. The filmmakers fell in love with Staff Benda Bilili's music and offered to pay for their recording sessions, before making a film about the group. We want all handicapped people to work. I don't look at the handicap, but what's inside the head. And if the head works fine, they should work too. Barret told CNN, "The idea was to record an album, because they were like virtuosos [who were] completely ignored, and we had the feeling that they could die very easily, because everybody dies very easily in Kinshasa -- which is not funny. "We had to do the album first. We didn't intend to do the movie, but we were filming them on a daily basis while doing the rehearsals, the ups and downs, and in 2006 we realized we had shot the inside story of complete outsiders trying to emerge in one of the most complicated and brutal cities in the world." In return for their financial support the band offered the directors rare access to areas otherwise off-limits to foreigners, and became their protectors throughout the five years spent working on the project. After a number of setbacks, including a fire that destroyed the shelter where they lived, Staff Benda Bilili's first album "Tres Tres Fort" ("Very Very Strong") was completed in 2009, to international acclaim. The release was coupled with a European tour -- the first time the members of the band had traveled abroad -- that saw the group play to sellout venues across the continent. Beyond its core members the group is made up of an acoustic rhythm section and the unique soloing talents of Roger Landu, who plays a one-string "electric lute" he designed and built himself from a tin can and a guitar string. Roger was a 12-year-old living on the street when he was introduced to the band. His homemade instrument immediately left an impression on band-leader Ricky Likabu, who took the boy under his wing. "He [Roger] was a street kid because he was sleeping on cardboard and begging for money with his instrument in the city market, being brutalized by older bad boys from the street or cops" said Barret. "He was very fragile and he could have died very easily. So getting in touch with Benda Bilili he found a family. And he just stuck to them all the time, and we saw him grow and improve his instrument. "You see him play and he's like Hendrix with one string ... it's amazing." Now Barret and de La Tullaye's movie, "Benda Bilili," looks set to introduce the group to an even wider audience. "It has changed a great deal because now all of them have a house, and all their kids go to school," said Barret. "They're able to pay school fees for all their kids, which is a good thing. "And they're here, no pressure -- to them it's just normal. They warned us in 2004: 'We're going to be the most famous band in the world,' and here they are. To them it couldn't have been different." They may not be the most famous band in the world -- yet -- but they might be the most inspiring. And their inspirational message is now being heard by a global audience. Likabu told CNN: "Our message to the world is: we want all handicapped people in the world to work. "Don't stay at home, don't beg, no! I don't look at the handicap, I look at what's inside the head. And if the head works fine, they should work too."